Access To Parks In Childhood Associated With Better Adult Mental Health : Shots - Health News Research suggests the more of your childhood that is spent surrounded by green spaces, the lower your risk of developing mental illness in adulthood, whether in the city or the country. 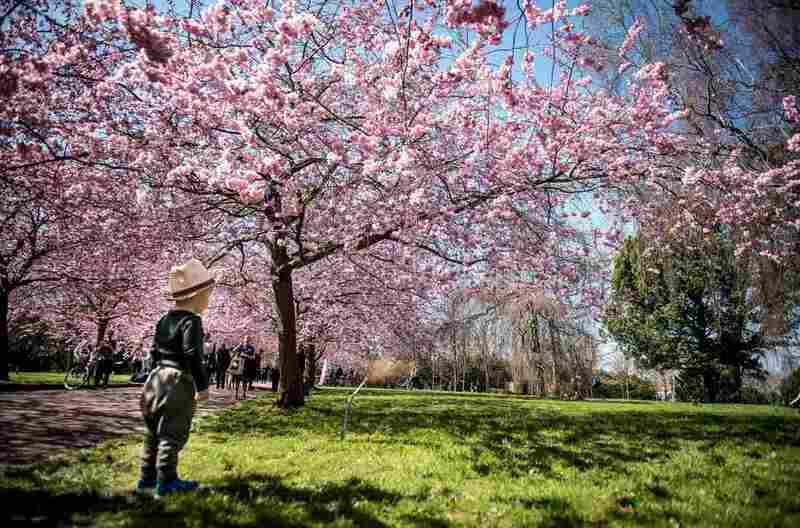 A child takes in the sights under blooming Japanese cherry trees at the Bispebjerg Cemetery in Copenhagen, Denmark. The experience of natural spaces, brimming with greenish light, the smells of soil and the quiet fluttering of leaves in the breeze can calm our frenetic modern lives. It's as though our very cells can exhale when surrounded by nature, relaxing our bodies and minds. Some people seek to maximize the purported therapeutic effects of contact with the unbuilt environment by embarking on sessions of forest bathing, slowing down and becoming mindfully immersed in nature. But in a rapidly urbanizing world, green spaces are shrinking as our cities grow out and up. Scientists are working to understand how green spaces, or lack of them, can affect our mental health. A study published Monday in the journal PNAS details what the scientists say is the largest investigation of the association between green spaces and mental health. Researchers from Aarhus University in Denmark found that growing up near vegetation is associated with an up to 55 percent lower risk of mental health disorders in adulthood. Kristine Engemann, the biologist who led the study, combined decades of satellite imagery with extensive health and demographic data of the Danish population to investigate the mental health effects of growing up near greenery. "The scale of this study is quite something," says Kelly Lambert, a neuroscientist at the University of Richmond who studies the psychological effects of natural spaces. Smaller studies have hinted that lack of green space increases the risk of mood disorders and schizophrenia and can even affect cognitive development. But more practical factors, like socioeconomic status, family history of mental illness, and urbanization can also have large effects on mental health. Wealthier families, for instance, might be able to afford to live in neighborhoods with more access to nature and also have access to other wealth-related resources that could enhance childhood development. To isolate the effects of nature from so many potential confounding factors requires a large and rich data set. The Danish Civil Registration System is just that. Created in 1968, the system assigns a personal identification number to every Danish citizen and records gender, place of birth and parents' PINs. A PIN links individuals across multiple databases, including mental health records, and is updated with changes of residence. "It's an incredibly rich source of data," says Engemann. The researchers' final data set comprised nearly 1 million Danes who were born between 1985 and 2003 and for whom they had longitudinal records of mental health, socioeconomic status and place of residence. Satellite data extending back to 1985 allowed the researchers to calculate vegetation density around each residence. Unfortunately these data can't distinguish an old-growth forest from an overgrown field, but in general the more greenery that is packed into a plot of land, the higher the vegetation density. Armed with these data, the researchers compared the risk of developing 16 different mental health disorders in adulthood with how much green space surrounded each child's residence. And because they had yearly income, work history and education level, they could weigh the relative contribution of green space against socioeconomics of the parents and neighborhood. After accounting for those potential confounding factors, the researchers found that growing up near green space was associated with a lower risk of developing psychiatric illness in adulthood by anywhere from 15 percent to 55 percent, depending on the specific illness. For example, alcoholism was most strongly associated with lack of green space growing up, and risk of developing an intellectual disability was not associated with green space. The strength of the association between green space and risk of psychiatric disorder was similar to other factors known to influence mental health, like socioeconomic status. According to Engemann, it is estimated that about 20 percent of the adult Danish population will suffer from poor psychiatric health within any given year, making these slight changes in risk potentially important. "Green space seemed to have an association that was similar in strength to other known influences on mental health, like history of mental health disorders in the family, or socioeconomic status," says Engemann. What's more, the effect of green space was "dosage dependent" — the more of one's childhood spent close to greenery, the lower the risk of mental health problems in adulthood. Engemann cautions that the study does have limitations: "It's purely correlational, so we can't definitively say that growing up near green space reduces risk of mental illness." Establishing cause and effect for variables like these is incredibly difficult, according to Engemann. Still, the breadth and depth of data used for this analysis add to the circumstantial evidence linking green space and mental health. "The effect is remarkable," says Lambert. "If we were talking about a new medicine that had this kind of effect the buzz would be huge, but these results suggest that being able to go for a walk in the park as a kid is just as impactful." The greenery association with better mental health held across both rural and urban areas of Denmark. "You could grow up in very urban areas but still have reduced risk if you're surrounded by green spaces," says Engemann. The study also can't address how different kinds of green space — and how people use it — affect mental health. Are forests more impactful than sparer park spaces? Do you need to actively use these spaces, or is simply growing up near greenery enough? These are questions Engemann hopes future studies can answer. One large question remains: Why? What is it about growing up near trees, shrubs and grass that seems to boost resilience against developing mental health problems? Lambert suggests the explanation might run deep, evolutionarily speaking. She says we evolved surrounded by green space, and something about being exposed to our "native" environment might have powerful physiological and psychological effects. Additionally, more green space might simply encourage more social interaction, exercise, or decrease air and noise pollution, all of which are known to impact mental health. Even exposure to a wider diversity of microbes in childhood could play a role. "There are a lot of potential mechanisms to follow up on, but generally I think this study is tremendously important," says Lambert. "It suggests that something as simple as better city planning could have profound impacts on the mental health and well-being of all of us."